The Nespresso coffee machine hisses in the background as Linda makes a change-of-watch latte. The faint glow under the eastern clouds heralds another beautiful morning at sea. We have 25 to 30 knots of quartering breeze, seas are 8 to 10 feet (2.4/3m), and Cochise is loving it. 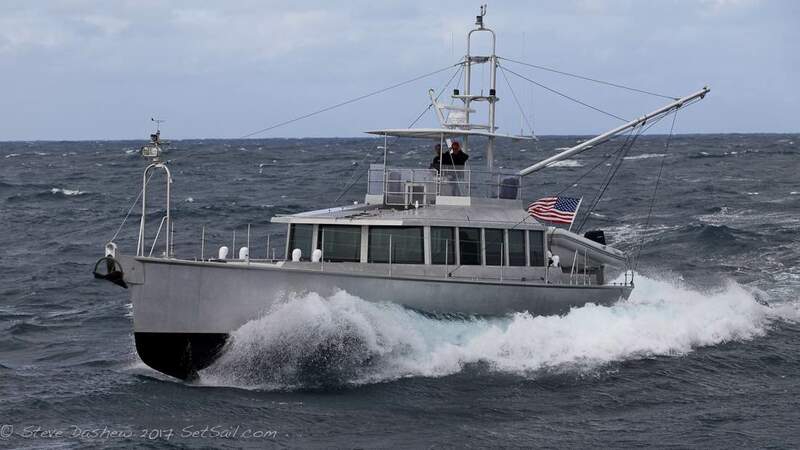 The little diesels turn 1600RPM and Cochise averages 11.5 knots, while surfs accelerate us into the 15 knot range. 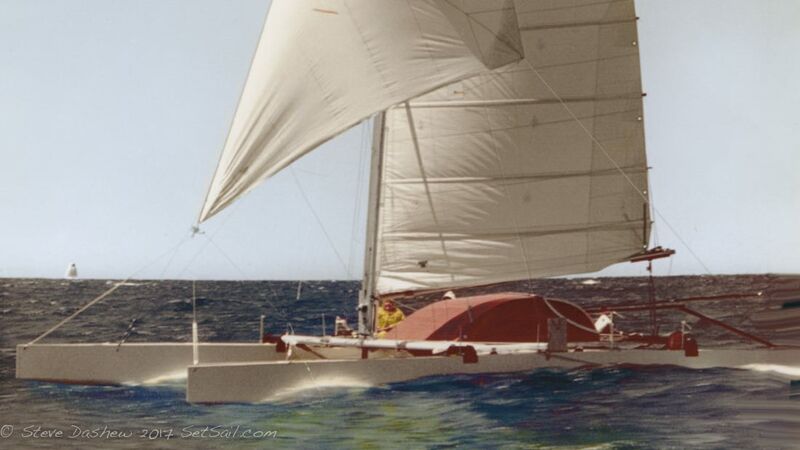 …we were designing, building and racing catamarans which performed at the outer limits of what was then considered possible. When the time came to make a change–we both felt the need–we sold the construction business, signed a five year non-competition agreement, and bought a 50-ft “cruiser/racer”. 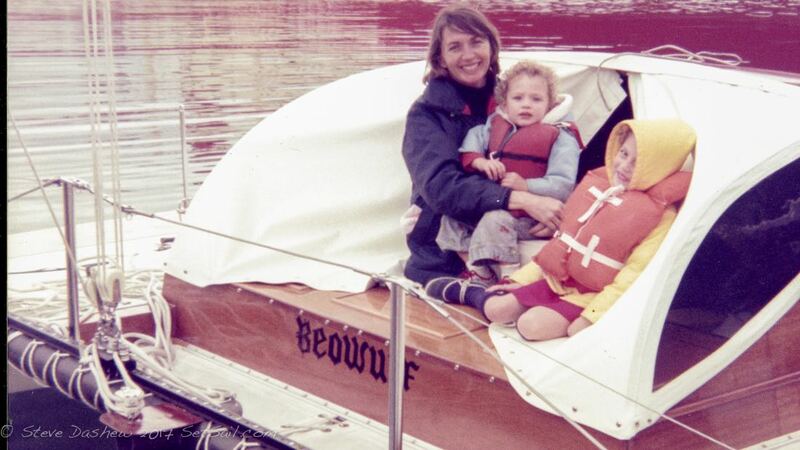 In November of 1976 we left on what we thought was a year-long sabbatical. Intermezzo, a Bill Tripp CCA design, was lovely to look at, but totally unsuited for long distance voyaging. Still, the allure of this new lifestyle was strong. One year became three, then six. 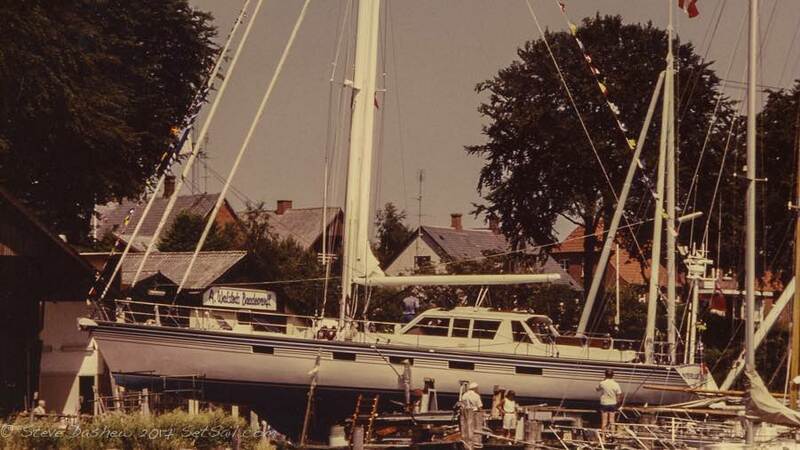 We are by nature tinkerers, and it was not long before we started chatting about the “perfect” cruising yacht, often picking up ideas from other long-term cruisers. As our ideas took shape, there was a sense that we might just be able to create something for ourselves that was special. And we were enjoying the teamwork involved in this creative process. 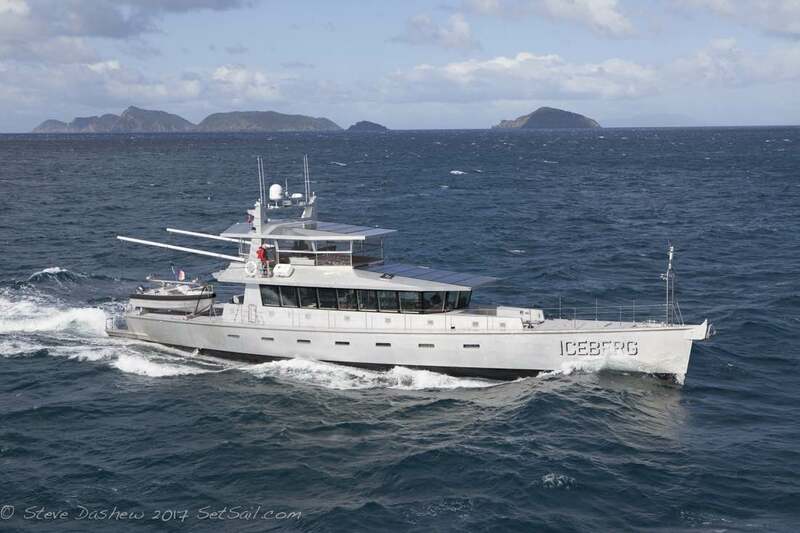 The 62-ft flush deck cutter Intermezzo II was the result. She was easy to sail, fast on passage, while at the same time being much more livable than our old boat. 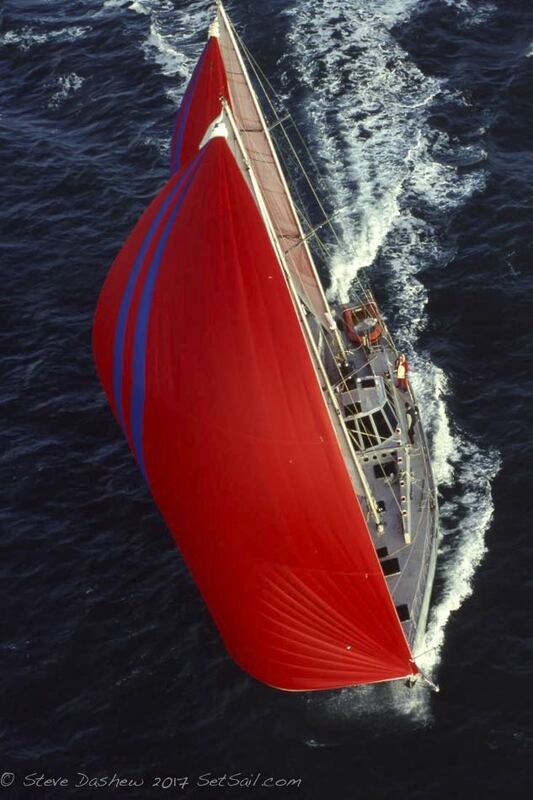 Her short overhangs coupled with high freeboard were radical for the early 1980s. When we got to the dock in San Diego, completing our circumnavigation, there was a friend waiting who wanted a boat. And then another, then a group…the rest, as they say, is history. 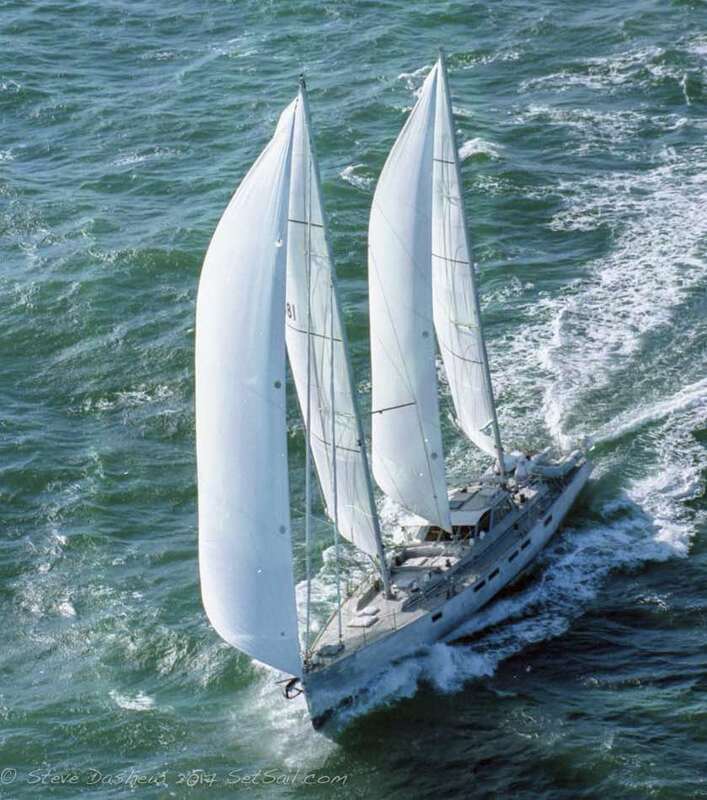 From the 80 hour a week construction business, to being full-time cruisers, then to the intense concentration required to coordinate design and construction of yachts overseas, the pendulum had swung back. Steve was traveling constantly to boat yards in various parts of the world and overseeing the design and construction, while Linda ran the house, made sure the family was taken care of, coordinated with vendors, did the books, and followed up with clients on many details. We were younger with more stamina then, had faster mental processing ability, and didn’t know enough to back off and take it easy. 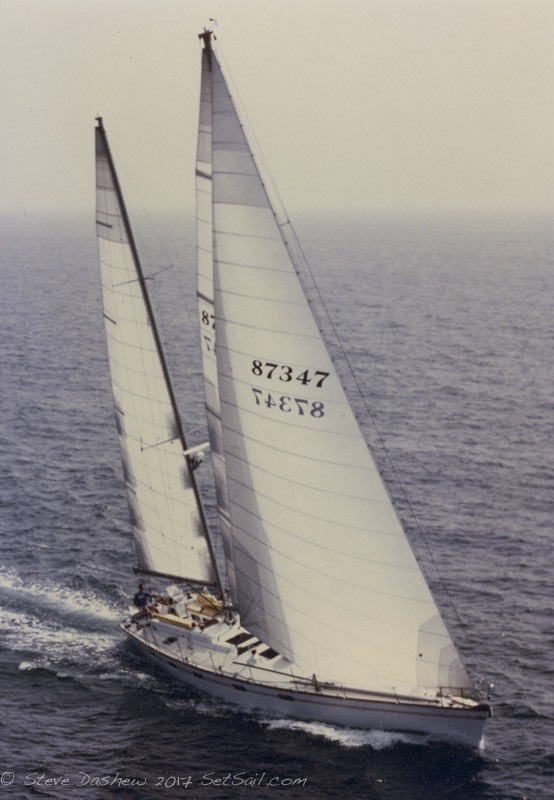 Over the ensuing decades we alternated between periods on land and at sea, never fully embracing either, while coming up with a series of cruising yachts for ourselves and others. We loved working together as a team, vetting design concepts, working through the thousands of details a modern yacht requires, and then sailing each new design, learning from each as the years and miles accumulated. 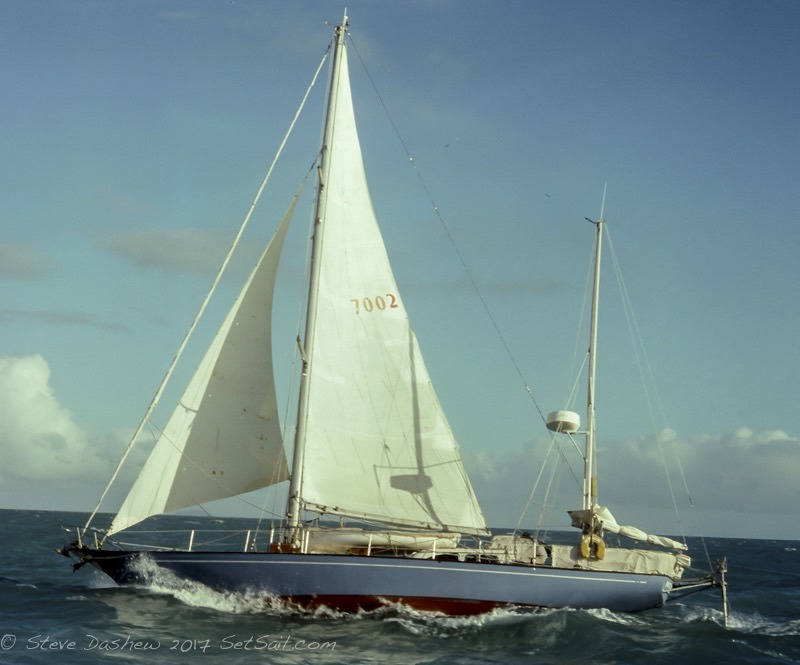 A series of yachts were built in South Africa, Denmark, Finland, and New Zealand, and then it was time to go cruising again. 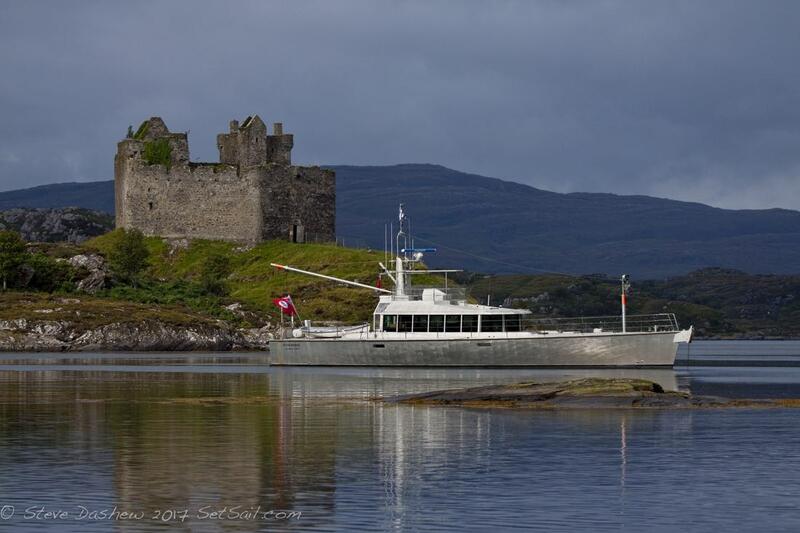 The New Zealand launch of our 68-ft ketch Sundeer heralded the end of the Deerfoot series, and when our daughters went away to college returning to cruising was a natural fit. We had no intention of building more yachts, but when the time came to sell Sundeer there were a number of disappointed prospects, and a group of folks came together who wanted a production version. The Sundeer series was born and we were back in the boat business. The two of us admit to being what might be considered perfectionists. We like things neat, orderly, efficient, and easy to live with – or on. The opportunity to pursue the ultimate cruising yacht has brought us back to the design table again and again. Mix this with a love of the sea and cruising lifestyle…you can see where it leads. By the time something like 30 of these yachts were out cruising we knew it was once again time for us to go. And we needed a new boat. This wasn’t an option. There was no choice. 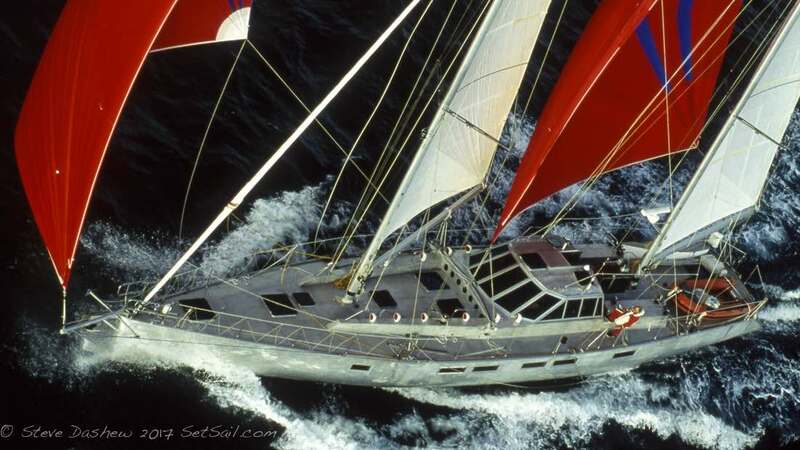 Beowulf, the 78-ft water ballasted ketch simply had to exist. 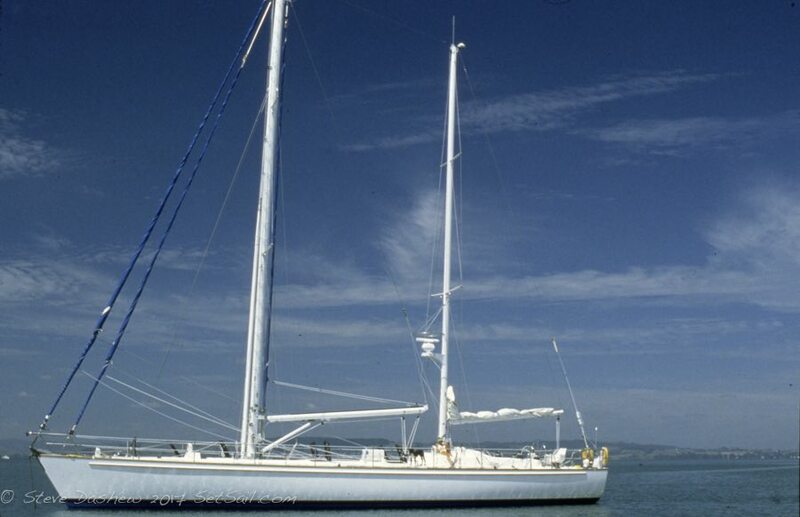 She was our perfect cruising yacht. 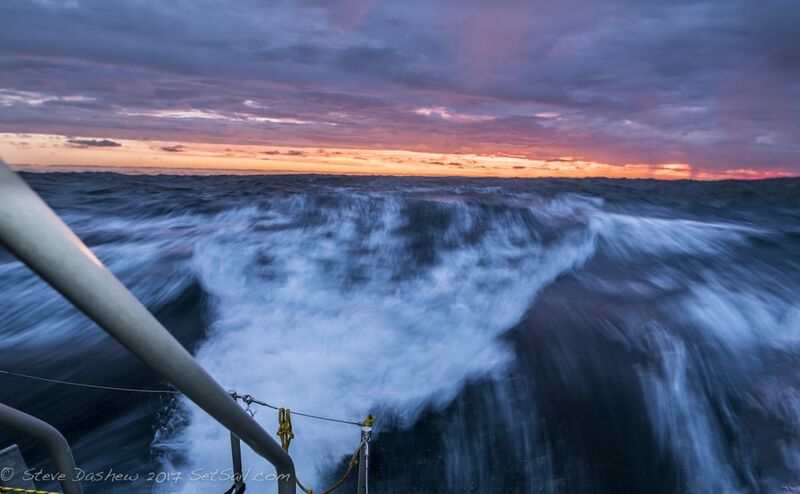 All that boat, as much as 6000 square feet of sail, and just two of us…“Impossible,” you say. No it was possible, and we did it, but with great care and respect, as Beowulf had the power to take over the game at any point. Talk about an intoxicating brew. Imagine yourself and your mate astride this flying machine, the bow lifted slightly out of the water, as you plane at 14 to 20 knots towards your next destination. We had to be alert at all times, there were no second chances, and there were knives placed at both masts to cut away sails should the need arise. When Beowulf was unexpectedly sold we were cast adrift. From the tension of wondering if we should douse the spinnakers at night before a squall hit, to the calm reverie of bucolic Tucson, Arizona, we were boatless and did not like it. Of course this led to fiddling, to new ideas, to several years of intense, totally focused design work. Having pushed the sailing design envelope to the extreme edge of what we could handle as a couple, we were up for something a little different. 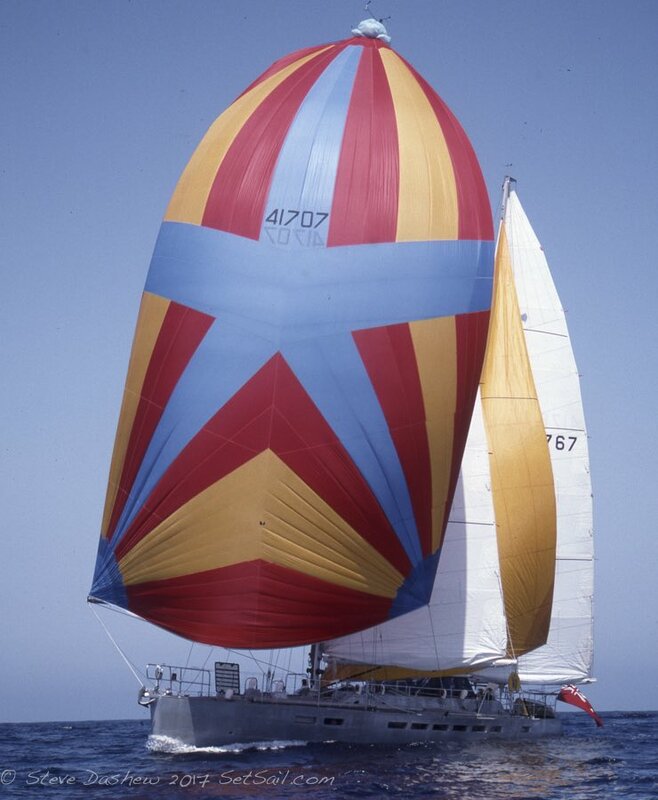 Enter the 86-foot FPB Wind Horse. 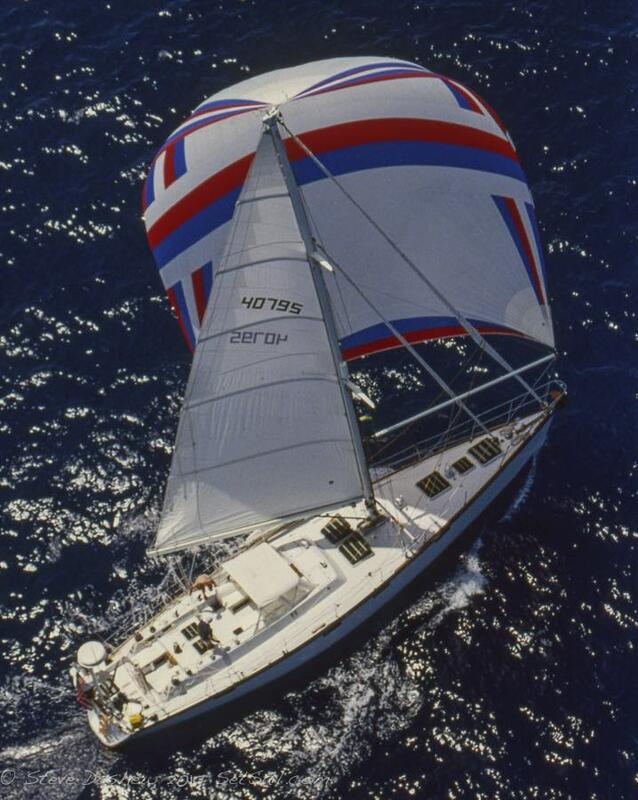 Wind Horse allowed us to cross oceans on our own much more easily and comfortably than in the past, with even better heavy weather performance. 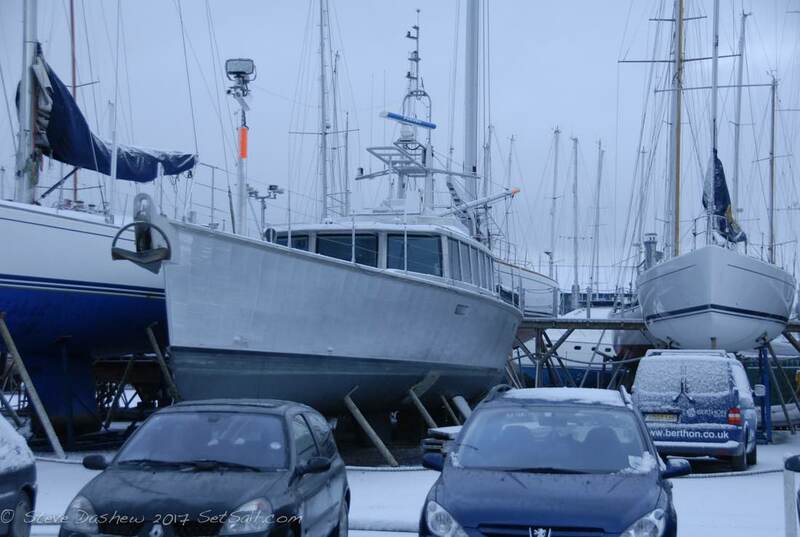 She could be hauled out, put into storage mode, and we would be on our way to our land base within a day. She made it possible for us to continue cruising as a couple in far more adventurous locations than we would have done in Beowulf, Sundeer, or Intermzzo II. 60,000 nautical miles flowed by in six years of part-time cruising. Wind Horse was such an amazing magic carpet for us that being drawn back in to the boat building business was probably inevitable. 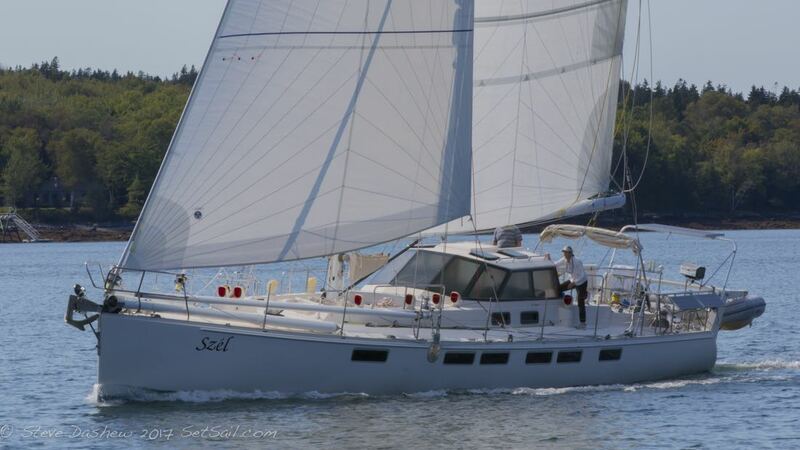 The pendulum had to swing back at some point, and what started out to be a couple of sisterships morphed into an 18 yacht fleet, ranging from 69-ft to 110-ft.
…Linda brings a latte and espresso to the great room table. I bring the toasted bagel we are sharing. Nancy Morrell is due on watch in a few minutes. She and Michael Morrell, friends and circumnavigators from Tucson, Arizona, have been with us now for six weeks. One of the reasons we designed Cochise was so that we could have friends and family join us for long periods, with sufficient space for everyone to maintain their sanity. So far it is working. We keep an eye outside for small boats, while the radar looks for targets and shows AIS symbols. This plays on a vertical 55” monitor fit into the face of a 36” tall locker where it does not obscure our view of the exterior. There is one problem with the FPB business model. 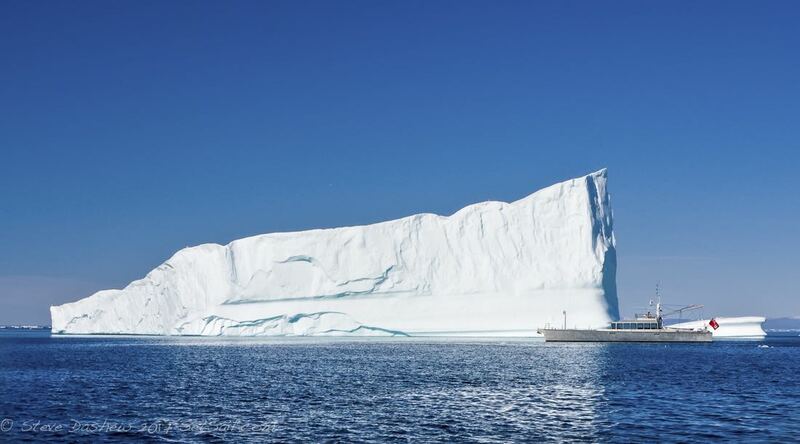 These yachts are larger and more complex than our sailboats. In order to get what we think is the correct result, an enormous amount of time and effort is required, leaving little space for other activities, such as cruising aboard Cochise. Cochise has taken us almost 15,000 nm in less than a year. She is well behaved, comfortable in the extreme, and for us, at this point in our lives, the ultimate dream machine. On the other hand, we no longer have the bandwidth to burn the candle at both ends. It simply is not possible for us to build FPBs with the present level of involvement and do anything else well. 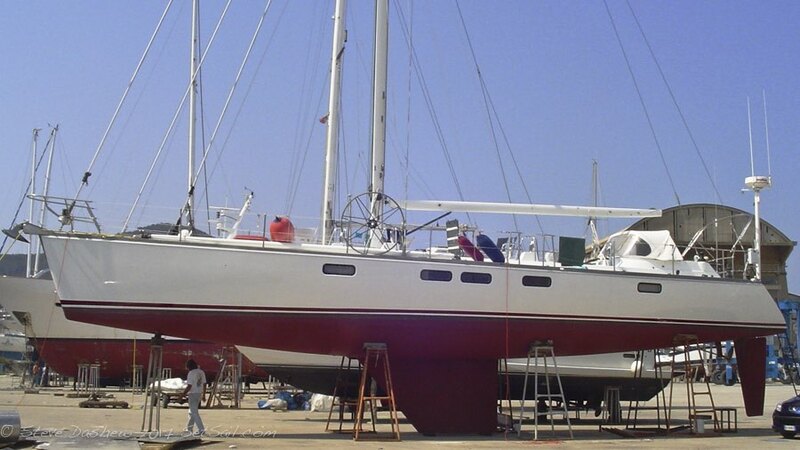 Linda points out that, even when we are cruising, constant contact with the boat yard and owners has to be maintained. Sitting close, touching lightly, we both know there is only one choice. It is simply not possible to cruise in a meaningful way and continue with the FPB business. The pendulum is swinging back. The three FPBs currently in build will be the last. It is time for us to go cruising, again. 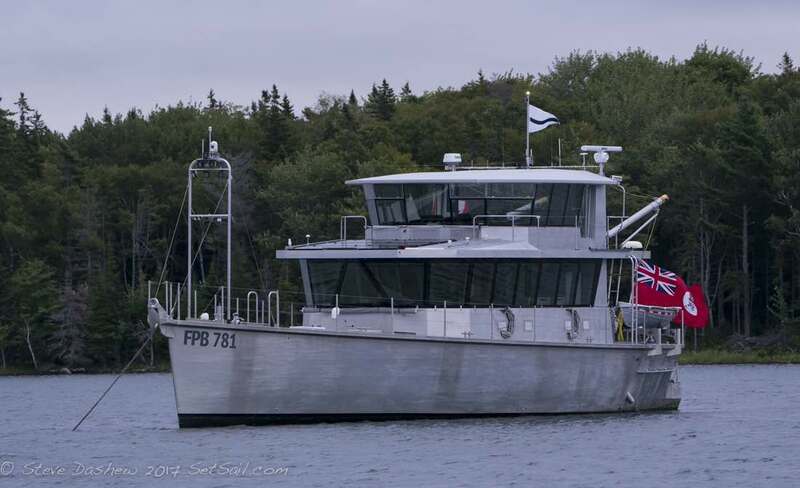 This entry was posted on Friday, September 29th, 2017 at 11:05 am and is filed under Dashew Offshore, Dashew Offshore History, FPB 78, FPB Series Notes, one, The Logs. Both comments and pings are currently closed. Are you selling the business or shuttering it? Will you still be posting things here (even occasionally) on your travels? Regardless, thanks for all you’ve done here to date. We decided not to sell the business. 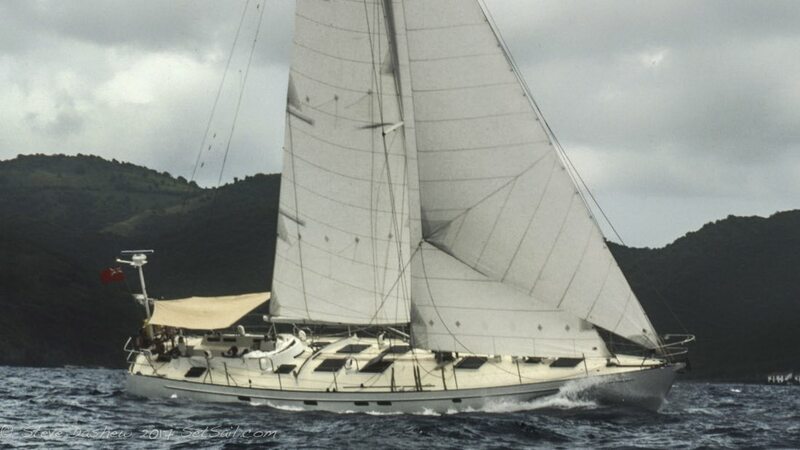 SetSail will continue, and Berthons will focus on the brokerage market nobody knows it better than Sue Grant and her team. Circa will continue to service FPBs in their part of the world. 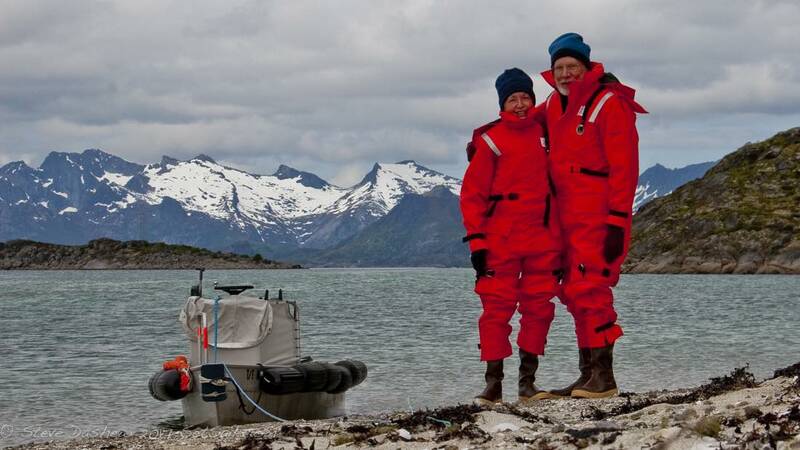 Steve and Linda, Thank you for sharing your adventures and knowledge over the years. You have been an incredible inspiration. I wish you the best as you start the next adventure! WOW. End of an Era. I’ve been following your journey pretty much since you started SetSail. This must have been a difficult decision for you. I’m not sure what i’ll do now if I ever get that ‘big win’ in lotto… I only want to go offshore in an FPB! Thank you Steve & Linda for all that you have contributed to sailing, weather, boat handling, and safety at sea. Thank you so much for sharing all of your knowledge and experience. Wishing you both all the very best. Great post and congratulations on the decision. Happy sailing. We loved meeting you at Musket Cove and hope our paths cross again. How goes the yacht design? My Name is Florian and I am in my late 30s and I have to thank you for all this shared information, these stories, these dreams. I am following every blogpost since 2009 and watched each of your uploaded videos more than once. It is also my first contribution as I am not there yet to afford one of this purest seavessels that exist. Kudos for all your lifetime achievements, for this fullfilled life that still has years to come. Lucky you to live your passion to the limit and I bet it was not always easy. It was to be expected that this would happen rather earlier and still it was in a way shocking. This finitive sentence … “This three FPBs currently in build will be the last”. Its hard to read and to imagine. No more FPBs?! No more of this spirit?! All this knowledge gone?! The world is now left with squareshaped stinkpots only (see -> NooOO)?! Enjoy your cruise you have worked long enough! May you witness thousands of sun sets to come. I have to say these past 3-4 years since I discovered this site I was amazed at the thought, time and energy that went into building these amazing boats. While I am bummed that no more FPB’s will be built. You two deserve to take Cochise over the horizon…..and simply have fun. Get a huge map of the earth, throw some darts at it and simply just go. I just want to say as a landlubber-computer-jockey…. I for one will miss the builds. But I wish you well wherever you travel. I’ve enjoyed the ride. I hope you continue blogging your wonderful adventures and beautiful photographs. I wish you and the lovely Linda all the best. You are a beautiful family! Thank you so very much for allowing us to venture with you two! The years have been remarkable. Thank you again for the patient answers to novice questions. While I cherish my copies or your books your Setsail.com has been a constant enjoyment over the recent years. I do hope you two consider chronicling your travels in articles for the various cruising magazines – have always enjoyed your writings. Well done, well earned, enjoy! I dream some day to own an FPB. I hope they are still available if I ever earn enough. 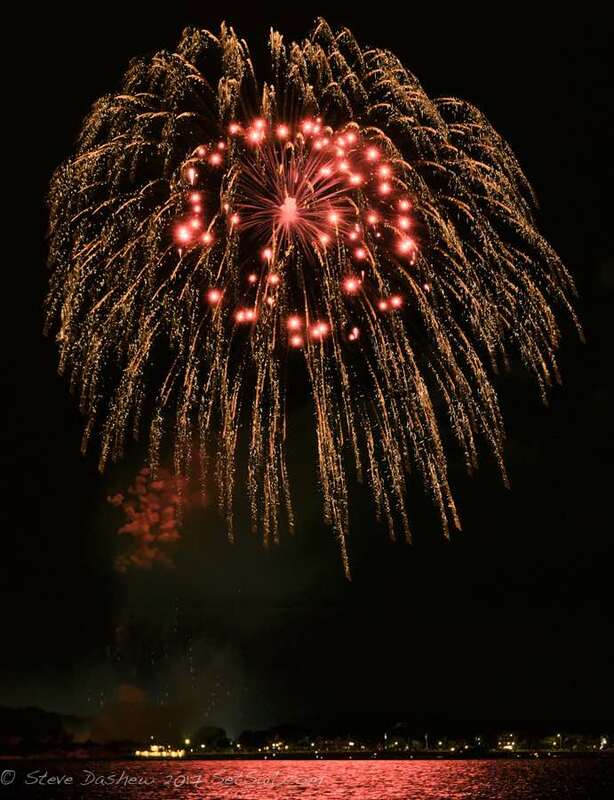 Congratulations enjoy life even more with less stress…….. I hope to see you in person soon. It has been an honor to meet and serve you here in Panama. Fair winds and following seas on your new phase…..thank you for believing in our little yacht service. Hope to see you a few more times at the Panama Canal, as you cruise the world. I have enjoyed your website and the information you have shared for many years. I learned so much about yacht design, and took little bits of info with me on my little sailboat. I have your encyclopedia, and hope to need it’s contents in more depth some day. You two have enabled so many to fulfill their cruising dreams, and even more to just continue dreaming well. Thank you and Fair Winds! BZ on following your dreams and I wish you both great times on Cochise. Hey Guys – Great re-cap of the life and time of Dashew cruising. We well remember meeting up with you and the girls in the Solomon Islands. Good grief – was that really 40 years ago? Loved having been a little bitty part of your cruising adventures. OK, someone(s) pick up the torch and let Steve and Linda catch a breath for a bit! The real test of the value of their work will be if it inspires someone(s) to carry on the journey. Take a well deserved bow. Relish the milage under the keel, knowing the last chapter was superbly designed & executed. Well done. You two are the best of the best. Thank you for many wonderful stories, and technical insights. Best Wishes on your next adventure! Sorry to read this. I’m five years away from retirement, so I will have to change my dream of owning a new FPB to owning a used one. Not a real prob for me. I completely understand you wanting to spend more time cruising without the obligations of production. But given all the hours/months/years you have put into designing and building FPB’s I am surprised you are not selling the business. There has to be some equity here. And if you don’t want to sell it as a going concern, will you be selling plans that someone could work with Circa on to produce a boat? Thanks and still look forward to following your adventures. Sorry to disappoint you on availability. That is one of the things which has held us back from moving on. Regarding your other questions, this is particularly difficult. There were many avenues open to exploiting the FPB label, and there was certainly money to be made. But yacht building is such a specialized art form, and there are so many disciplines which inter-relate, that making the right choices often comes down to your experience and outlook. There are few absolutes in this game. 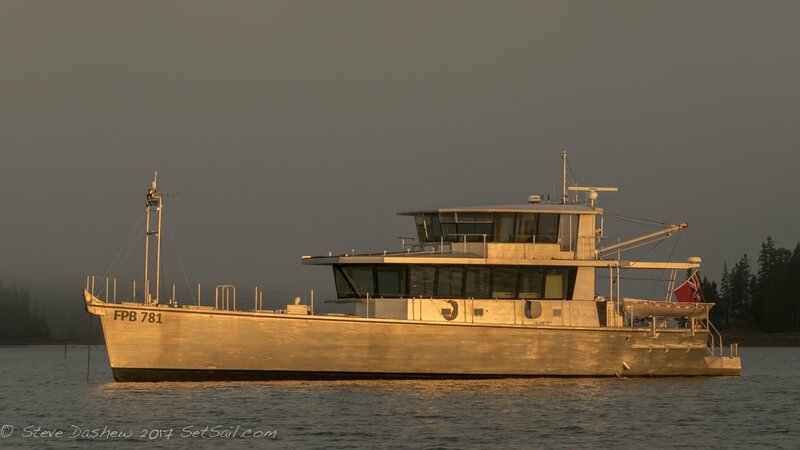 Having spent the better part of two years looking for a formula that would guarantee us both long term viability and consistent execution to an approach which we are not willing to compromise, it was decided that ending with the boats currently under way was in the best interests of our own peace of mind and the reputation that the FPB fleet has earned. Thanks so much for the quick tour you gave me at Grand Narrows on Cape Breton Island. I was thrilled by your unexpected hail to come over and raft up. What wonderful and inspiring people you are. I am still amazed at the hospitality and generosity given to a total stranger. Remembering Windhorse from so many years ago and experiencing Cochise up close are lifetime highlights for a dedicated boat aficionado like me. Would’ve loved to been able to spend more time with you and been able to give you a tour of Black Pearl. Hope to see you again in the near future so we can pick up our conversation from where we left off! The pleasure was ours and we would love a closer look at your Pearl. From the exterior details somebody knows what they are doing! If any two designers have earned the right to choose with your heart, it is you. Looking forward is the only way to get there, sally forth and fill that cup! …..and when the itch returns I hope the eFPB is in the forefront of your thoughts. Congratulations on the well earned retirement. I wish you all the best with your future cruising plans. Like other people responding to this article, I’m a bit disappointed that these great boats will not be made in the future. Have you considered making the plans open source for the community? I’m a software engineer by trade and we see this a lot in our world. By contributing your legacy to the community, people can pick up where you left off. The consistent execution is no longer in your hands, but clearly in the hands of the people deciding to use and/or improve your plans. Furthermore the FPB brand can maintain its high standard name, you can cover such terms in your license agreement with the plans. It is clear that you are not choosing the path with the most financial gain, making the plans open source fits well in that vision. Let me know if I can give you some pointers in this direction from my point of view. 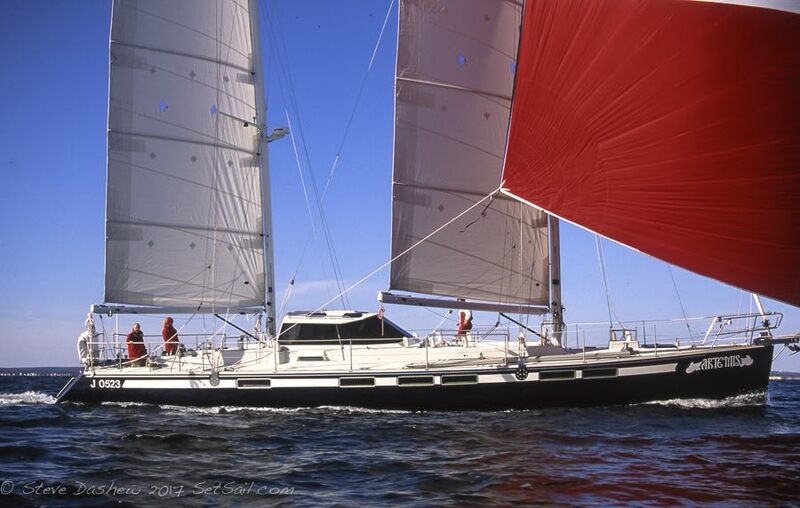 The decision making matrix involved in one of our yachts is not easily reduced to a set of rules or specifications. There is simply too much impact of the collective individual choices on the ending product to simplify this process. How we do things is based on our own experience living with the choices that have been made, as well as a clear set of design objectives. At the same time, as any builder who has built our yachts will tell you, we always look for perfection, even if we do not always achieve it. Decisions which we feel miss the mark, typically unnoticed by the builders and/or clients, drive us crazy. None of the preceding is conducive to us enjoying a worry free life after FPB experience if the boats continue to be built after we step aside. We wish this were otherwise. We would love to have a formula that allowed the FPB program to continue. But wishing won’t make it happen, and it is best if we, and everyone else accept this, and move on.